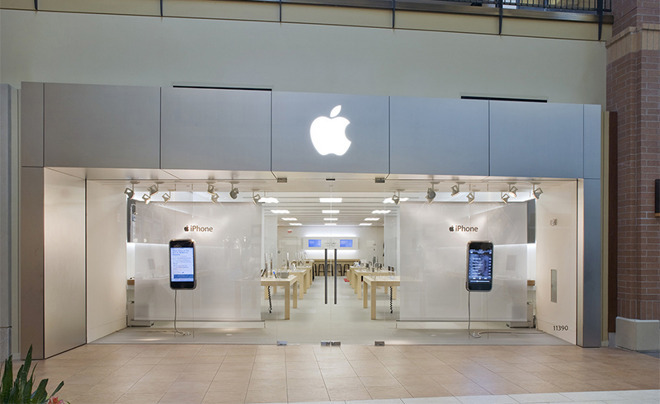 Apple's lone retail outlet in Iowa, which has served Apple faithful for the past 12 years, is about to get a long-awaited makeover that promises to nearly triple floor space, and could introduce the "next-generation" Apple Store design language currently rolling out at international flagship locations. According to The Des Moines Register, Apple's Jordan Creek Town Center store in West Des Moines, a modest mall outlet, will almost triple in size after the company finishes a massive five-month renovation. Building permits seen by the publication carry construction costs valued at $3 million, with final estimated floor area coming in at about 7,160 square feet. To accommodate the renovation, Apple is taking over two neighboring storefronts formerly leased by Brookstone and Clarks shoes. While the exact design and floor plan has yet to be revealed, it can be assumed that Apple will apply its "next-generation" Apple Store aesthetic to the refreshed space. Dreamed up by retail chief Angela Ahrendts and CDO Jony Ive, the new store interiors follow an open design philosophy, but come with the usual wooden product showroom tables joined by a Genius Bar and neatly arranged display cabinetry. Apple most recently opened the doors to a "next-generation" Apple Store in Memphis, Tenn., which features a huge 37-foot TV display rumored to cost $1.5 million. Whether the upcoming Des Moines store will get a similarly gigantic installation is unclear. The upcoming Iowa expansion will be Apple's first in the state since its lone Des Moines store opened in 2004. Apple plans to take up residence at a temporary location across from the construction area starting April 13. The renovation process is expected to take about five months, the report said.